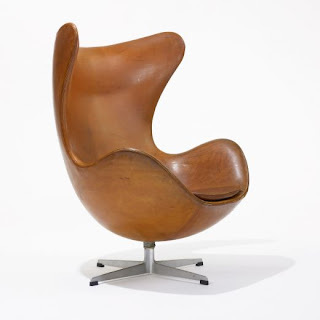 Vintage leather Arne Jacobsen Egg Chair 1958. Drop. Dead. Gorgeous. One of a pair at Wright's Important Design auction. Details here. That's a beautiful specimen-- the leather almost looks like burled wood. That is lovely. Last fall I saw an exhibit about influences of the Cold War on popular culture and learned the egg chair and similar womblike domestic items responded to a need for protection and shelter against nuclear warfare. That's a lot to ask of a beautiful chair. It does make you want to curl up inside and hide from the world, doesn't it? This has been one of my all time favorite chairs forever! This one is exquisite. Have a good weekend! Timeless beauty -- lovely! Great design never goes out of style!